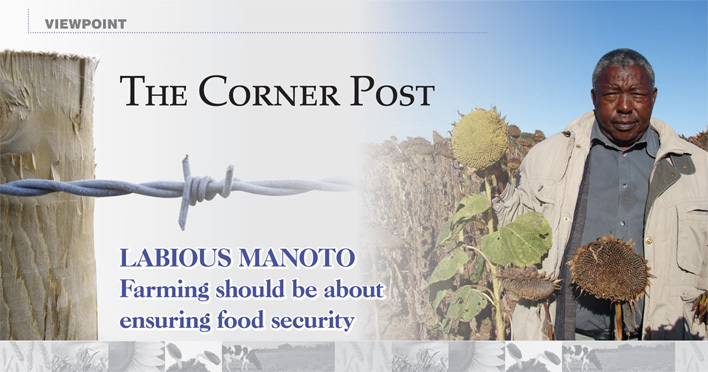 The winner of the 2008 Grain SA Developing Farmer of the Year award, Labious Manoto, feels strongly about the role of politics in agriculture. “It is through politics that agriculture is suffering. I wish politicians would realise that farmers are the ones providing food,” he says. Labious dreams of a country where politics play no role in agriculture so that all farmers, who are passionate about farming, can focus on one collective goal: Producing food to ensure food security in our country. This farmer from the North West Province mentions that his love for farming comes from his parents, Paul and Francina Manoto, who were subsistence farmers. “I was raised by a farmer to become a farmer,” he adds. His initial trade as a builder for the former Bophuthatswana government was short-lived and he started farming in 1976 at Lombaardslaagte, Gelukspan and Deelpan. Currently he farms in the Lusthof district near Lichtenburg on 500 hectares of own land where he grows maize and sunflower and also farms with cattle and sheep. He proudly mentions that this land has been bought and registered on his name. Apart from his own land, he also farms on 480 hectares of communal land at Lombaardslaagte. To ensure a future for his children, he would like to buy more land and expand his livestock division. He realises that farming is not an easy career choice. “Nothing happens without hard work. Circumstances beyond our control contribute to difficulties, which make it imperative for farmers to be flexible,” he describes his view of farming. Philip and Andrew, Labious’s two sons, have joined their father in this farming enterprise to learn firsthand what agriculture is all about. This father of five mentions that he is currently not serving on any committees, nor is he actively involved in organised agriculture as his sons are not yet ready to manage the farm without his expertise and input. During the evaluating process in 2008 the panel of judges described him as an experienced, hard-working farmer whose tractors and implements are well looked after. He wants to make sure that all these principles are developed in his two successors by the time he hands over the reigns to the next generation. His three daughters have chosen careers in the fields of teaching, banking and medical services. Violet, his supportive wife, sadly passed away in 2014. The award he received in 2008 was an incentive to work harder and to give his all to his own farming operation. It further encouraged him to keep abreast of technological and agricultural development to ensure sustainable farming. He believes that setting a good example is the way to entice young people to become interested in choosing farming as a career. Share the real facts about agriculture – it is no good sketching a picture of it being all moonlight and roses. This will help eliminate those who are not born farmers. Farming is a calling. You need passion to farm. You have to be prepared to work long hours for little money as farming conditions are mostly such that the profit margin is initially really small. You have to build your farming enterprise as you would any other business. Start small and grow. Learn from other more experienced farmers and never think you know it all. Join study groups like those of Grain SA. This month's edition of The Corner Post was authored by Louise Kunz, Pula Imvula contributer.